We have today launched our new website – the result of six months of hard slog by our team – lead by our Market Manager Anna Livingston. In today’s world where access to information and data is king, we recognised our website might hold lots of good information but if it wasn’t readily available and searchable, it wasn’t being used. The rise and rise of the status of avocado has seen a proliferation of photos of avocados so the visual aspects to the website weren’t the challenging part. It is the decisions around how to host the information, how much detail to include, how far back do you want to go? Are research reports from 1990 still relevant? And the answer was sometimes a resounding yes. Although the world has changed hugely in the last 20 years, the way we grow avocados hasn’t changed too much. The problems a grower may have had with boron deficiency in 1998 are still similar to what that grower might be challenged by today. Certainly our research is bringing new information but it seems we still need to refer back to older research – even if to prove that we are making advances. I challenged our research manager some months ago about the yields we can achieve on avocados orchards in New Zealand. As the New Zealand apple industry strives for yields of over 100 tonnes per hectare and the kiwifruit industry successfully achieved yields of yy, I asked, why are our target yields only 12 tonnes a hectare across the industry, even recognising that some growers do achieve over 30 tonnes per hectare. Part of that answer may be that the majority of avocado trees remain the same structure they have had for the last 50 years. Think back to the apple tree in your grans garden and the commercially grown apple tree now, and the different is remarkable. We are working on new structures for avocado, and would dearly love a dwarf variety of avocado tree to be bred, and we are pruning our trees possible 3 times as frequently and as severely as ten years ago. So structure is work in progress. But what we did come up with was some other stats we don’t often use in comparisons. 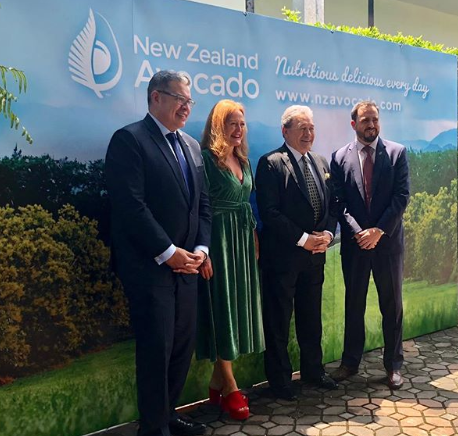 And as we are seeing some significant conversions of dairy farms to avocados orchards in Northland, I thought, why not compare avocado stats to dairy – as New Zealand main export? Just prior to Christmas I journeyed up to Tapora to meet with one of our newer growers who has converted a dairy farm in Tapora to an avocado orchard. Those conversions created news several years ago and I was invited recently to speak at a conference attended by a number of dairy industry professionals. I acknowledge that the topic of avocados is a pretty easy one – people do love to talk about avocados but I wanted to include information that might be of particular interest to those dairy industry experts. I recalled some data we had produced on the nutritional attributes of avocados. Avocados are nutrient dense, full of 19 minerals and vitamins, and contain fat (the good stuff) carbohydrate and protein. I wanted to see how the outputs from a hectare of avocados in production might compare to a hectare of dairy farm. Knowing that scientifically avocados do full you up, I expected the calorie output from avocados to exceed that of dairy and they do, producing 21million calories versus just under ten in dairy. I know we have good fats in avocados, so I expected that our comparison to the fat in milk powder might be a good statistic to show as well. I am yet to take that further and calculate the amount of good fats produced in each option. What I didn’t expect was that a hectare of avocado produces a pretty impressive amount of protein –a third of that produced on a hectare of dairy, obviously taking into account avocados have one crop per year and the cow is milked either daily or twice daily. I ended that particular presentation suggesting not that avocados should take over our dairy industry (although we are enjoying the growth of avocado production as a result of a little of that) but suggestion that we do need to talk more about diversified farming in New Zealand. Four hectares of avocados on a warm dairy farm (north of Opotiki, unless climate change kicks in faster than we expect) could be the perfect succession planning a family needs. We suggest four hectares because one that doesn’t take too much off the dairy farm and two, because anecdotally one person/family can manage four hectares of avocado production, with help needed only for harvesting. And imagine the new menu ideas for dinner when avocados are ready for eating 12 months a year, right on your farm. Disclosure – The numbers have not been scientifically verified and are sourced from a number of different reports. Share the post "The rise of avocado"